The patient, a 56-year-old female presenting for MVR, was positioned on the surgical table and standard monitoring was initiated with ECG, BP, pulse oximetry, end-tidal CO2, and central venous line for CV/PA pressures, SvO2 and cardiac output, and bladder temperature. The Nonin Medical EQUANOX™ Model 7600 Cerebral Oximetry system and 8004CA EQUANOX Advance sensors were placed bilaterally on the patient's forehead prior to induction of anesthesia to obtain baseline rSO2 values. Low alarm limits were set to 75% of baseline values. 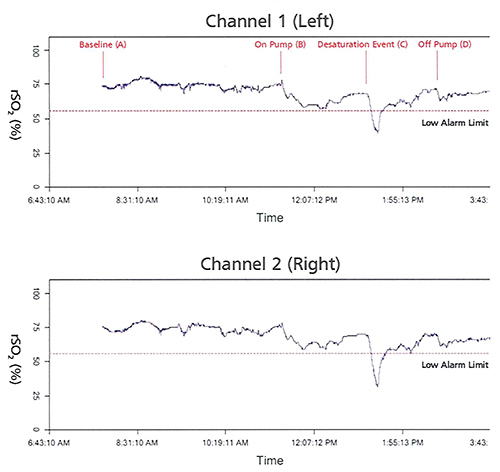 Cerebral oximetry remained within acceptable ranges and dropped to approximately 80% of pre-intervention values after going on pump and decreasing flow at the surgeon's request. At 1:13 pm (see graph), the EQUANOX system showed a desaturation event with a low alarm limit. The rSO2 reading changed from approximately 68/69 to a nadir of 39/31 over the course of 11 minutes. As rSO2 began to fall and approached the low alarm limits, perfusion confirmed that arterial flow, CI, SvO2, and CDI parameters were within normal limits. The MAP and venous drainage had not significantly changed. The anesthesiologist and surgeon were notified of the cerebral desaturation and the surgeon noted that the SVC felt full. The venous cannula was manipulated by the surgeon and immediate increase in venous return was noted. The EQUANOX system showed rapid return of acceptable rSO2 levels and slowly increased to pre-event levels. The remainder of the case was without incident. EQUANOX cerebral oximetry provided valuable first alert of an event in time to prevent ischemic injury to the patient.